Back in the 1980s my Uncle – a great man who has since passed on – arrived in Denver to take me on a trip: We flew from Denver to Durango on an Aspen Airways Convair. 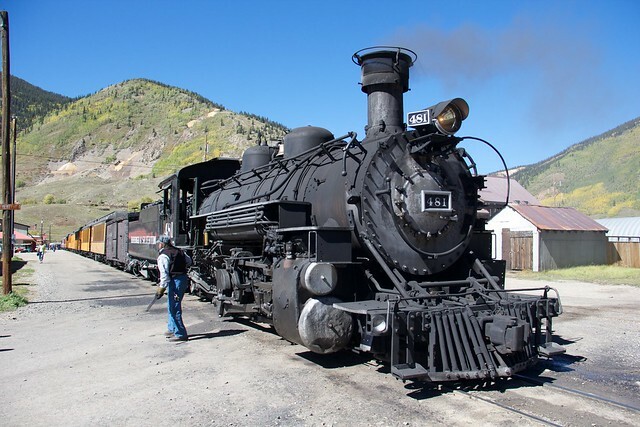 In Durango we stayed at the Strater Hotel and, as the main featured activity, rode the Durango and Silverton Railroad – a historic narrow gage railroad. This trip represents the strongest memories that I have of my Uncle. A couple years ago I asked my Mom and Dad about it – while both clearly remembered the trip, neither could remember my exact age, nor could they really tell me why my Uncle, a lawyer living in DC, decided to visit us and take me on this trip. 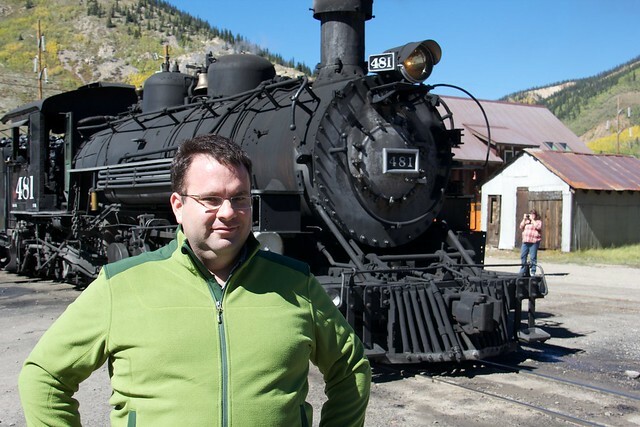 Here I am in front of the train. With these memories floating through my head, I decided to relive this aspect of my childhood. 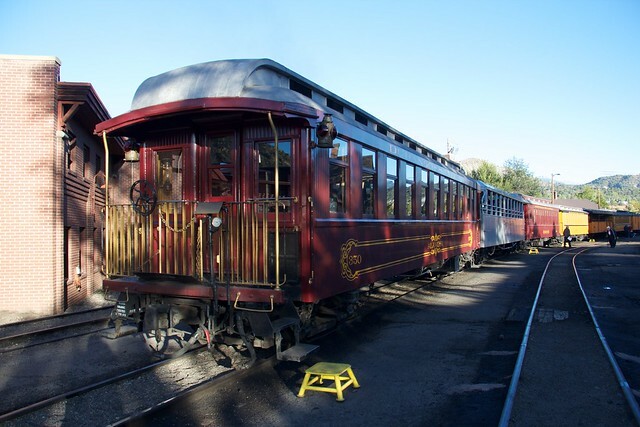 There’s no way to exactly replicate the trip – Stapleton International Airport no longer exists and Aspen Airways has been relegated to the history books as well – but the Strater Hotel still exists and the Durango and Silverton Railroad still runs its trains. So Wednesday I found myself at Denver International Airport boarding a propjet, a Q400, to Durango. My first flight being repeated – I found myself remembering the excitement of my first flight, that first take off, and… uh… I fell asleep this time. I was exhausted. 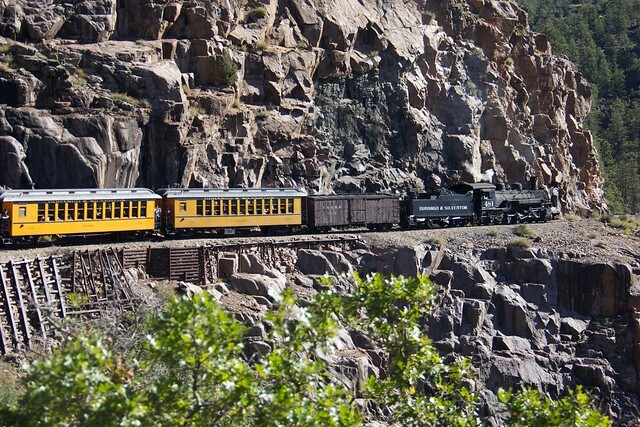 The backend of the Durango and Silverton Railroad. Thursday I was on the train, the 8:45 to Silverton. There’s not a lot to say about the ride – it’s 3.5 hours up to Silverton, plus another 3.5 hours down, along with 2ish hours in Silverton for lunch and shopping. The scenery is stunning – especially in the fall, with the changing aspen leaves. The valley offers beautiful waterfalls and stunning vistas. The train, prepared to head south from Silverton. It was a great day – I enjoyed it more than I expected. Wallowing in these memories is a luxury that I am thrilled that I can do – and it’s made me think about childhood – maybe one of the most important things that parents can do is build memories. 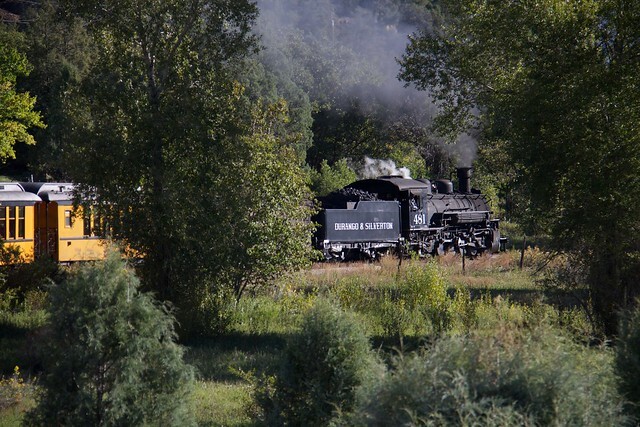 5 comments to Reliving My Childhood: Visiting Durango, riding the Durango & Silverton Railroad. The third photo the train looks as perfect as a model railway – like the one in Hamburg! I’d so much love to take that trip. I’d love to take Antonio on this! Adam, what fun. keep on having fun. I sure had fun with you in Denver. Ian — it’s well worth it, even better in the shoulder season — fall — when the Aspen trees are changing colors. Eva — It was fantastic seeing you in Denver. I look forward to seeing you again!